The 7I54 is a low cost 6 Axis H-bridge card for use with Mesa motion control cards. The 7I54 has a maximum per axis current rating of 3 Amps and a voltage rating of 40V. Current limits of 1 Amp and 3 Amp are user selectable, as are voltage and current (torque) modes. 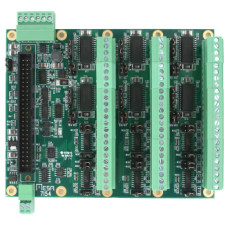 All motor power circuitry is galvanically isolated from the controller interface.The H-bridge chips (Allegro A3959) use DMOS transistors and synchronous rectification for high efficiency and low power dissipation. PWM rates up to 50 KHz are supported. The 7I54 also conditions and multiplexes the encoder input signals and supports both TTL and differential encoder inputs. The controller connection is a 50 pin header that matches the pinout of the Mesa 50 pin FPGA based motion controllers. The 7I54 uses Phoenix compatible 3.5 mm headers and is supplied with pluggable terminal blocks.